In our newest guide, "7 Elements your Homepage MUST Have", we review some important considerations when designing a homepage. In this article, we'll look at how we addressed some of these elements for one of our clients. 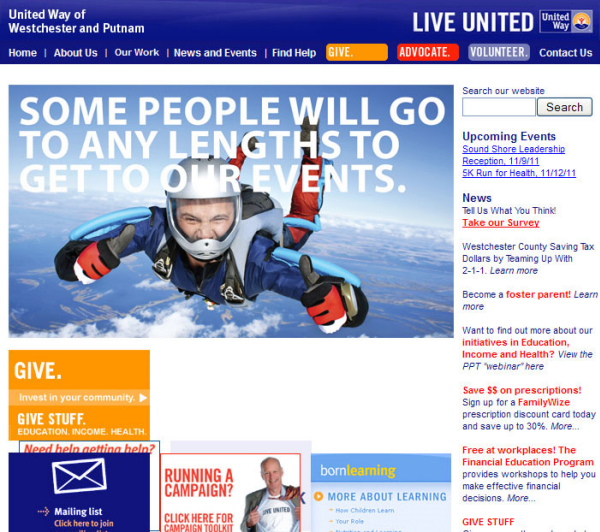 This is the "BEFORE" screen capture of the web site we are featuring today. There were multiple challenges for this site, but one of the main objectives was to help guide site visitors to the particular information they were interested in. The site is quite large, and the organization speaks to several target audiences. This challenge speaks to the first of our 7 Elements - EASY NAVIGATION as well as the fourth -CALL TO ACTION. Let's take a look at how we met these challenges within the new site design and layout. Below is a screen capture of the redesigned site. You'll see a reorganized navigation structure based on the user's interest, target audience and objectives. By providing several different navigational menus, we were able to direct the user to the information that is most relevant to their objective. The GIVE | ADVOCATE | VOLUNTEER menu allows users who are looking to become involved with the organization a path to follow to find information about how to proceed. 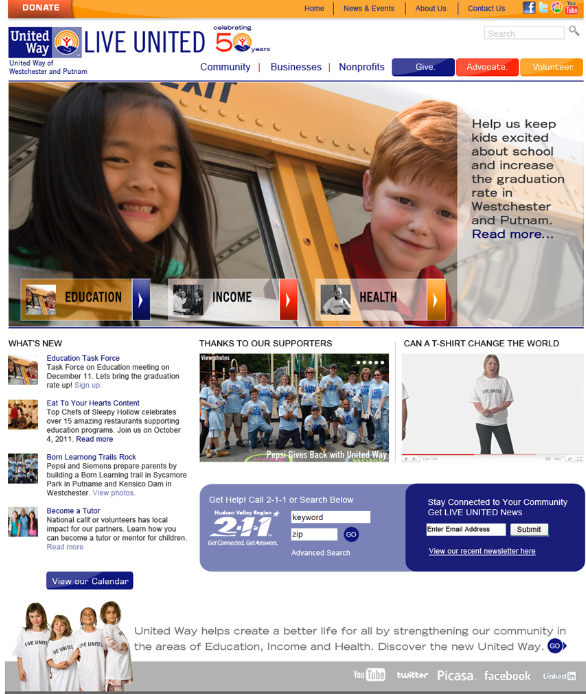 United Way has initiatives involving EDUCATION, INCOME and HEALTH. The large buttons allow users to quickly find information about specific initiatives in these three areas. We have a menu to the left for COMMUNITY | BUSINESS | NONPROFITS which speaks to the different types of users that come to the site. If you are a business, you'll find information about how your business can connect with UW. The second element we addressed was to include some clear Calls to Actions or CTAs. One could argue that the GIVE | ADVOCATE | VOLUNTEER menu itself could be considered CTA's, but in this case, they are used as navigational cues for those visitors that are searching for ways they can become involved. While the redesign itself helps to support the organization's brand, the information architecture overhaul really helps site visitors navigate through the large amount of content easily.ut we included CTA's for two of the most commonly used actions on the site. The GET HELP with 2-1-1 CTA allows users who come to the site in need of assistance to access the searchable database of services available to them. We included CTA's for DONATE, STAY CONNECTED through the newsletter and access to the calendar with a VIEW CALENDAR CTA. If you haven't already downloaded our FREE GUIDE, you can find it here!